I have copied and pasted below the Affordable Care Act section designed to assure that health insurance companies, in the absence of a free competitive market, do not overcharge for premiums and enjoy excessive profits. Reading this short section will help explain why few if any in Congress or the Executive Branch read the whole 906 pages before passing the law and why we had to pass the law and turn it over to the regulators in Health and Human Services to find out what is in it. In plain English, this section of the ACA requires that benefits paid out by insurance companies in the large group market must equal 85% of the premiums collected. A company that fails to meet that target must rebate some of the premium income to policy holders. For insurance companies in smaller markets, states may ease that requirement to as low as 80%. That sounds innocent, but reflects government naiveté about the economics of running a business. It could just as well have said that insurance companies in the large group market are guaranteed that 15% of premiums collected will be available to cover costs and profits, or, for non-profits, to cover costs plus investment in expanding the business. I’m not sure about the accounting rules for insurance companies, but for manufacturers, a key result is the Gross Margin, the difference between the Revenue and Cost of Goods Sold, the money that is available to cover overhead, advertising, selling, etc., the costs generally called SG&A, or Sales, General, and Administrative. Research and Development also must be paid for from that Gross Margin. It would have been interesting if the company I worked for had benefitted from a government guaranteed Gross Margin, but that wasn’t the case. We were subject to all kinds of competitive pressures including variable market prices for our products and for the raw materials and utilities we purchased. Thanks to the Affordable Care Act, Health insurance companies will not face such competitive pressures. Given the guarantee of a certain percentage gross margin, what will be the logical strategy of both for-profit and not-for-profit insurance companies? It will be to maximize premiums and benefits because 15% of a bigger number is a bigger number, and there are economies of scale available. It will not cost as much to serve the second million policy holders as it did to serve the first million. And the result of that strategy, of course, will be greater spending on health care. Paying out more benefits in one year will justify raising premiums in the following year, and the absolute margin for overheads and profits will continue to expand. It is exactly the opposite of what has happened over the past couple of decades for openly competitive markets for such as computers and televisions, laser eye surgery, and teeth whitening. Prices and margins have continually decreased. Health care spending has already expanded because of the pay-for-procedure precedent that has been established by Medicare and other insurers. If an insurer will pay $1000 for a CT Scan, the obvious strategy for a hospital is to invest in the equipment and do as many CT Scans as possible. Once the equipment is bought and the staff are hired and trained, all the costs except electricity and laundry are fixed, and, once those fixed costs are covered, almost all additional revenue is profit. All providers are getting reimbursed the same amount, so cost reductions go straight to the bottom line, and there is no motivation to reduce prices. “Do more scans” becomes the motto. And health care spending rises. The law of unintended consequences rules. Except I suppose that the insurance companies saw all along the likely result of this provision so for them, it will be an intended consequence. We really can’t blame them. If they are highly regulated and not allowed to compete, they have to try to make sure the rules favor them. And with the fixed availability of 15% of the premiums to the insurance companies to cover their costs, the motto becomes, “Collect More Premiums; Pay More Benefits.” And, policy holders can expect rebates because the best financial strategy for insurers will be to get the full 15% each year by having to rebate. Much better to overcharge a bit and then send rebates than to end up with a smaller gross margin. Unfortunately, just as we tend to celebrate our income tax refunds of our own money, we will probably brag on those insurance companies that rebate some of our own money. It’s an example of the Stockholm Syndrome. There are only two ways to reduce health care spending in the USA. One is to restrict and ration availability. The other is to allow free market competition and make providers compete for customers based on what they are able to pay. So far, we haven’t made either choice, and it will be business as usual for total national health care spending growth. Well, there is a third option: Healthy living. And I’m guessing that having to pay for our own health care might tend to motivate healthier living. Now, just for fun, please read this little except from the Affordable Care Act. Note the ominous phrase, “…the Secretary may…” It occurs 390 times in the Affordable Care Act. One other point. 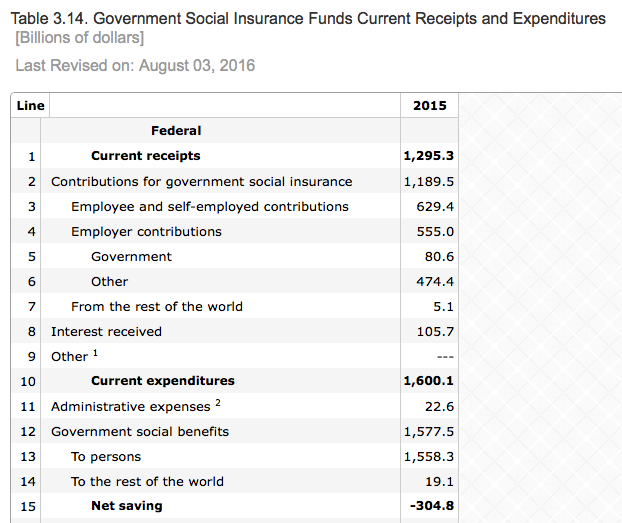 Before jumping to the conclusion that the federal government could have provided this insurance at a lower cost, take a look at the federal government Social Insurance Funds Receipts and Expenditures for 2015. The table below, copied directly from government published data, show that Government Insurance Inc. paid out $1.6T from receipts of $1.3T. Well, no wonder so many people want government insurance! For a comparison with financials of one of the biggest health insurance companies, go here.